Mary Ann Barclay deserves better. My friend Mary Ann was reinstated in her United Methodist ordination process in Southwest Texas yesterday. Even though she was approved by her church and a district committee, her conference board broke their own rules by voting her out without ever interviewing her. Her bishop, after over 6 months, finally overturned their discriminatory action, granting her the right to an interview. Many are saying that this decision just delays the inevitable—in a year she will meet with her conference board and they will vote her out. But I don’t think it will be that simple. The individuals on this board now have to see Mary Ann as a person: read her writing, listen to her story, and look into her eyes before they will be allowed to deny God's call on her life. It is one thing to vote out an abstract lesbian, it is quite another to enter into another’s life and tell them to their face that they were wrong about their calling. To do that, board members of Southwest Texas will have to decide to ignore their conscience and the Holy Spirit. History books will record Mary Ann’s name alongside Anna Oliver and Anna Shaw... both denied ordination in in the 19th century on the grounds that "there is no place for women in the ordained ministry of the Methodist Episcopal Church." I am sorry to trouble our dear mother Church with any perplexing questions, but it presses me also, and the Church and myself must decide something. I am so thoroughly convinced that [God] has laid commands upon me in this direction, that it becomes with me really a question of my own soul's salvation. If [God] commands me to just the course I am pursuing, as only they that do [God's] commandments have right to the tree of life, I have no alternative. 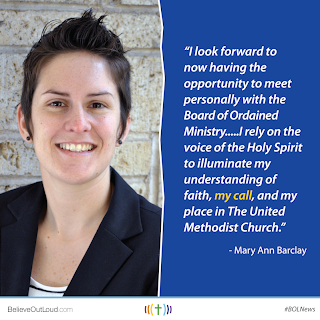 Mary Ann has no alternative than to follow God’s call on her life to minister in The United Methodist Church. My hope is that board members will have no alternative than to follow the Spirit’s call as well. Today two men in Birmingham refuse to give up their spot. Today the opposition continues to blast their harmful water hoses. Today Methodist bishops call on a colleague to stand down. Today fear and bigotry fall victim to love and justice. You rocks who have remained silent. You rocks petrified by the fear of retribution and revenues. You rocks stoned on the drug of appointment ladders. You rocks threatened by ecclesial Pharisaic control. Today God is doing a new thing. Today changes everything in The United Methodist Church. Today a United Methodist bishop joins two grooms into one. Today "Dearly Beloved" is spoken, and Beloved Community is made real. Today Joe and Bobby are a sign of God's love changing the world. You know how today ends. Today, on the 50th anniversary of Dr. Martin Luther King, Jr.’s “Letter From a Birmingham Jail” and on the morning after the act of terror at The Boston Marathon, here are words of intersection… As we hear the word “extremist” being used in the media to describe unimaginable hate, Dr. King's letter beacons us, still to be a different type of extremist. Was not Jesus an extremist for love: "Love your enemies, bless them that curse you, do good to them that hate you, and pray for them which despitefully use you, and persecute you." Was not Amos an extremist for justice: "Let justice roll down like waters and righteousness like an ever flowing stream." Was not Paul an extremist for the Christian gospel: "I bear in my body the marks of the Lord Jesus." Was not Martin Luther an extremist: "Here I stand; I cannot do otherwise, so help me God." And John Bunyan: "I will stay in jail to the end of my days before I make a butchery of my conscience." And Abraham Lincoln: "This nation cannot survive half slave and half free." And Thomas Jefferson: "We hold these truths to be self evident, that all men are created equal . . ."
In that dramatic scene on Calvary's hill three men were crucified. We must never forget that all three were crucified for the same crime—the crime of extremism. Two were extremists for immorality, and thus fell below their environment. The other, Jesus Christ, was an extremist for love, truth and goodness, and thereby rose above his environment. Perhaps the South, the nation and the world are in dire need of creative extremists. Therefore, the United Methodist Men are calling on the Boy Scouts of America not to change their ban on gay scouts and scout leaders because we need more time. I am a member of the United Methodist Men. They helped pay my way through seminary and I witnessed the power of men’s ministry at many of the churches I served. That is why I am deeply saddened after reading this statement over their lack of courage to be United Methodist. You see, even if you agree passionately with United Methodist doctrine and polity, there is nothing in our Book of Discipline that would support young men being excluded from a church sponsored troop based on their sexual orientation. The Discipline talks about all people being of sacred worth, and calls on United Methodists to be in ministry with all people. My United Methodist Church professes an open table and believes that God and God’s prevenient grace is in and with all people, even before we are aware of her presence. John Wesley believed that fellowship, study, building relationships, and conversation with others could be a means of grace where we are transformed into something new. Jesus showed us what love looked like as he again and again embraced the marginalized. It is not our theology to make decisions based on people’s threats of taking their money and leaving… that is the theology of capitalism. It is not our theology to base our polity on what will attract the most people and retain them… that is the theology of consumerism. It is not our theology to hinder the access of children and youth… that was the theology of confused disciples who mistakenly believed they were gatekeepers, deciding who could and couldn’t come to Jesus. The United Methodist Men say we just need more time to preserve retention and expansion of scouting programs in The UMC. The chorus of the privileged majority gets sung again and again, “we need more time,” and the latest group to join the refrain is the United Methodist Men. More time means more boys subject to bullying and exclusion. More time means higher rates of suicides among gay adolescents. But perhaps the most crucial reason we don’t have “more time” is because we need to stand up and be United Methodist Men. We are not a church that has any more time for injustice. To read the United Methodist Men's full statement from Feb 19, 2013, click here. If you've never heard of Bayard Rustin you are not alone. But you should know him. Bayard Rustin is perhaps the most significant organizer for social justice and civil rights in American history. He was the man behind Rev. Dr. Martin Luther King, Jr, teaching King everything he knew about non-violent resistance, civil disobedience, and organizing a movement. Certainly The Movement would not have succeeded like it did without MLK's brilliance, but King would be no more than a prophetic preacher if Bayard Rustin hadn't introduced him to the ideas of Gandhi and given King the strategy to change the world through peace. So if Bayard Rustin is so important, why has history forgotten him? Why isn't he celebrated? Why was he hidden by The Movement itself? When those opposed to The Movement learned of Bayard Rustin's sexuality, they sought to use it against the entire fight for civil rights-- even from the floor of congress. As result, Bayard Rustin worked from the background, hidden from public eye and left out of the history books.There is no justifying the horrible injustice that has been done to Bayard Rustin. However, we can't change what our heroes of the Civil Rights Era choice to do to protect a vulnerable movement. What we can do is reclaim his name, sacrifice, hard work, and character today. That is why today, I am introducing a petition to President Barack Obama to award Bayard Rustin posthumously with The Presidential Medal of Freedom. We need 100,000 signatures by February 17th, 2013. Together we can help honor a man who gave his entire for the Civil Rights Movement. He deserves to at least stand behind, if not next to Rev. Dr. Martin Luther King, Jr. Click the picture below to sign the petition and share this with your friends. Below is a video and other links to more information about Bayard Rustin's life of service. You have probably read his Letter from a Brimingham Jail, but have you read Dr. King's letter from a cell in Albany, GA? In it King makes the argument that when "the non-violent resistor refuses to cooperate with a law that is out of harmony with the laws of God and the laws of morality, he must break the law-- but in doing so, practices civil disobedience and accepts the penalty, thereby practicing moral obedience and transforms the jail into a haven of liberty and freedom." Over Labor Day weekend Reconciling Ministries Network will be holding its convocation in D.C. themed "ChurchQuake: Embracing Freedom". There is a story in the Bible of Paul and Silas locked up in a jail cell for their civil disobedience. And when they began to sing songs, the earth shook and their chains were released. I have to wonder if Dr. King had that story in mind when he transformed a jail in Albany into a haven of liberty and freedom.